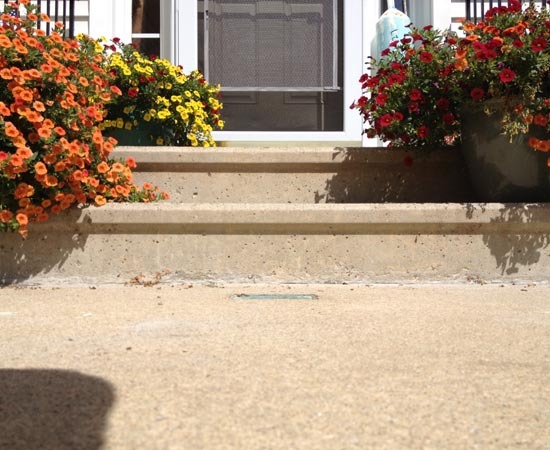 This sunken slab in Massachusetts was evident with a noticeable gap between the concrete slab and concrete stairs. 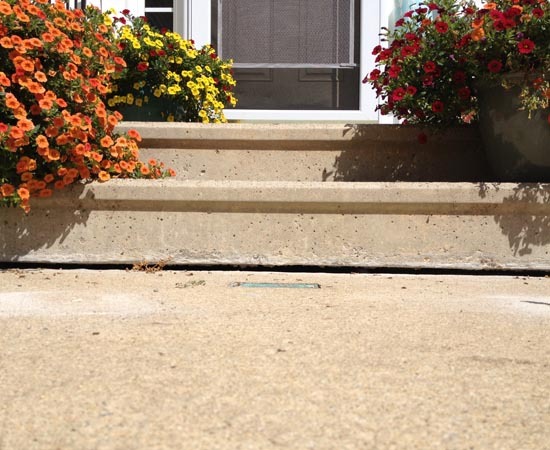 The concrete leveling process quickly raised this Massachusetts slab within minutes of injection. Slab Problem: This 55+ community contained large areas of concrete walkways. A short time after the concrete was built, many slabs sunk due to the poor soils below. Within a few years, the condo association was faced with a multitude of tripping hazards and uneven concrete surfaces. The condo associated desired an alternative solution to a "tear out" approach as the disruption of jackhammering and concrete work was not wanted in a community like this. Concrete Leveling Solution: The association elected to engage EFT to provide a series of urethane foam injections for the slab repair. Over forty slabs were rapidly lifted within a weeks work with minimal disruption with the slabjacking process. This new technology provides clients with a cost-effective and minimally disruptive means of repairing concrete slabs.